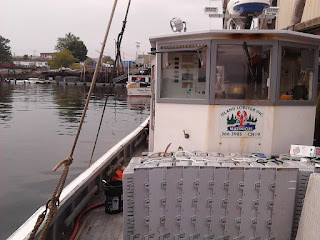 Notes from the island, music and zero carbon lobster harvesting. August is not known for fog. It's been a pasty murky clammy mess for two weeks. Lesson 28, sub 3. When bilge is full of oil, and no amount of consultation with experts, contortional stuffing upside down into small spaces, automotive/dental mirrors, profanity or reasoning produces an explanation, AND the engine is running smooth as the brush of a cat on your leg, you, the proper fisherman, go hauling. You do. I, on the other hand, fume and stew and worry and then eventually decide to go hauling anyway. I got to the point where I was perfectly willing to keep pouring in engine oil in exchange for being able to work and pay for whatever repair is in my future. It came on gradually, then suddenly, with that deep adrenal defibrillation whereupon I decide (again) that I am stupid to be in this business. This business where the ancestral GPS of lobster cycles and migration is absorbed by 12 year olds, not 50 year olds. The gradual part was that oil inched ever so slightly down the dipstick over a couple of weeks. Not generally a big deal especially because it always does that when it's time for an oil change, which it was. After I paddled out on a Sunday morning to change the oil, fuel and hydraulic filters and set about my business, there was a stomach lurching moment when the oil pump stopped after about 9 quarts. It should have been 11 or 12. A reluctant peek into the bilge showed two things. First, the bilge pump was not working. Wires that ended in mid air probably had something to do with it. Second, and much uglier than a recalcitrant bilge pump was the copious, odious, obscene and altogether appalling amount of oil in the bilge, glaring up at me in black, grinning, leering clots, maliciously swaying to and fro in the beautiful Sunday morning sunshine. After swabbing up as much as I could of the oil, I began untangling and tracing wires associated with the pump and float switch. After reconnecting the works, I expected action. I pulled up on the float and got only silence. Hmmph. I ripped everything apart and grabbed the multimeter, a very handy tool in learned hands like Paul's. In mine, as we'll see, it's a mixed blessing. Monsieur Multimeter said there was only something like 1.28 to 3.69 volts coming from the source, depending on how well I gouged the pointy thing into the wire. I figured that even with my limited and patchy nollidge of wiring, I could find the problem. After scratching the fuse cap at the battery end with a rusty bait knife, I had a nice strong 12.48 volts and the pump hummed cheerfully when I got the wires touching correctly. Not so good with the switch, as in silence again. After a trip to town and couple of days' office work, I came back to Matinicus after closing a commercial transaction, rushing to Rockland, hopping the lobster smack and falling asleep, bringing with me a nice clean new float switch and a bunch of handy heat-shrink splice connectors. By 8:00 or so, I had put everything back together in mild drizzle and not so mild amounts of mosquito bites and then flipped the switch. Nothing. What tha F, for F's sake?!! I checked the wires with the multimeter: 12.49 volts DC. I hot-wired the pump to the source with no switch at all. Nothing. Rechecked the volts. 12.48. Silence. Must be a bad pump, right? After another trip to town and another few days of office work, I returned with a new bilge pump. Now I had new connectors, switch and pump and the multimeter said there was 12 volts and change. All new connections, shrink wrapped for waterproofing. Flipped the switch. Nothing. F'ing stupid F'ing M'f-er!!! What am I doing wrong?! I went back to the errant fuse cap at the battery end of the wiring chain and saw nothing wrong. A few inches aft of there, however, was splice connector, and not the handy heat shrink water proof kind. A friendly shake showed the connection was sloppy-loose. In the meantime, I'd brought my oil drenched old bilge pump and hand hotwired it to the battery, at which time it abruptly buzzed and spewed oil, indignantly proclaiming there had never been anything wrong with it in the first place, dumbass. The rest was routine. New connections, new pump, new switch, and a new knowledge that 12.48 volts on the multimeter is not a guarantee of wiring integrity. The big problem of a significant oil leak is still with me. The lobsters, however, are also present. As a result, I go out, knowing that above the deck, all is well while below, the oil trolls are laughing, dancing and procreating in my boat, the slimy bastards. Now after several hard but productive days, there is only the pale gold to dark blue corona in the west. I want for nothing. Except Megan. Loading groceries in the Hannaford parking lot, it was 5 or 10 degrees below sweltering and in all other ways a beautiful late July day. Wrapping up office business late Thursday morning, I was, without much conscious thought, looking forward to getting spots with Megan on the afternoon mail flight back to Matinicus. It did not occur to me that the warm humid air of summer was turning into chilly opaque paste as it moved across cold ocean water, making the climate very different a few miles off shore such that no planes were going anywhere near the island. These small drops of water run the show in summer as much as wind and tide do year round. So it was that I was caught off guard when Sally told me it probably wasn't going to happen. Megan and I have learned that uncertain travel prospects are best met by going to the departure point and being ready to jump instead of hanging back. Even with this force of optimism, we arrived at the Penobscot Island Air den of office cabins and got the same answer about flying conditions. Curiously, loitering at the air service produced not the slightest improvement in the weather. I called Fiona, who told me it was bright and clear at home in the middle of the island. She biked to the airstrip and reported that it was clear right to the shore but not beyond. After some stewing and a low-grade tantrum about missing a hauling day with lobsters on the verge of hitting and a big block of next week lost to a trial, we called Marty the lobster dealer, who put us in touch with Jeb on the Bajupa (named for Barbara, June and Pat), the lobster smack. Jeb was just coming into Rockland and thought he'd be heading back out in a couple of hours, but also might be helping work on another boat. 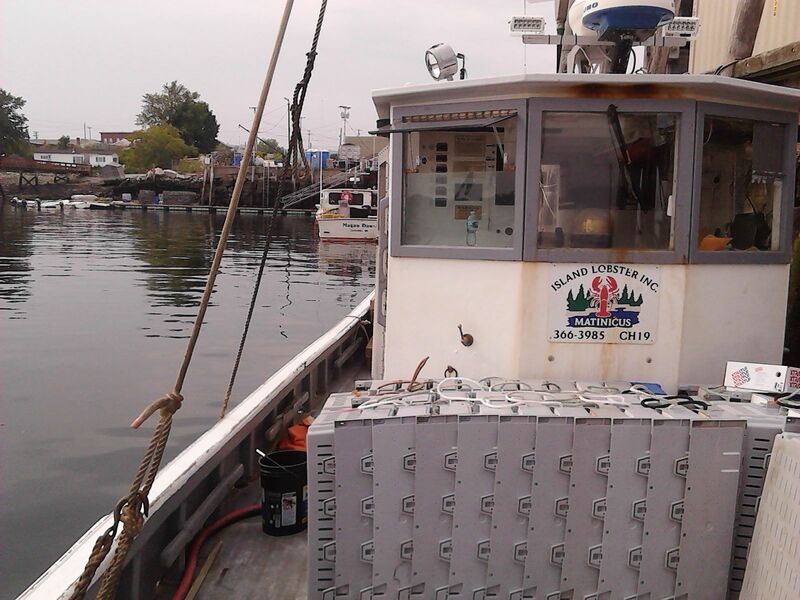 After thinking through how to get from Owls Head to the fish pier, what to do with cars, and how much of an obstacle was presented by the Lobster Festival being in full swing, we decided again to try and get to the departure point and be ready. Traffic was pretty manageable and we picked our way around trucks, a forklift and stenchy puddles of fish goo to where Jeb was finishing loading bait into Bajupa's hold. He thought he'd be heading out around 4:00, giving us time to deal with the car and cool it with a beer. Having a pretty sure ride lined up was a huge relief. It would mean a late arrival, to be followed by pumping oil into a 50 gallon barrel at the wharf, lugging it to the side of my barn and pumping it into the tank so there would be hot water in the house. It was probably more like 5:00 by the time we left along with a collection of other fishermen and a Dachshund named Isla who spent the voyage in the bunk, snugged against her sleeping fisherman. They both looked pretty comfortable. We got to Harbor Point on Matinicus at dusk and had our groceries and supplies winched up onto the wharf. Our truck, however was at the airport. Jeb loaned us his truck, an early 80's Silverado with an approximately one by two foot opening in the driver's side floor where my left foot would normally rest. By the time the trucks had been swapped around and returned, the oil pumped onto my pickup, the pump assembled and put to use, the burner bled and hot water reestablished, it was close to 10:00. The mail flight would have been on island at 1:15 PM. That was our commute. Big thanks to Marty and Jeb. Because of them, we were able to haul the next day. Fair to middlin' catch but a catch nonetheless. musician, lawyer, dad, fisherman, adventurer.